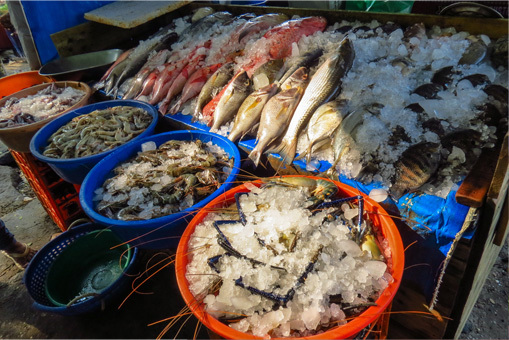 Fisheries form an important sector in the Kerala’s economy. As Kerala is a coastal state, it is bordered by the Arabian sea on the west. The coastal area of the state extends to a length of about 590km. The territorial limits of Kerala are 22 kms from the sea shore and the area in this territory that is covered by sea is around 13,000 square kilometers. It is in this area that the fishermen do their job. The shallow seabed that surrounds the state is around 3919 square kilometers. This region is considered to be very fertile. The capability of the state in marine fisheries is about 5.17 lakh tonnes. The fishermen of Kerala contribute a percentage of 3 to the economy. Moreover they help the state in earning huge amounts of foreign exchange and goodwill. The fisheries here are very famous all over the world and so are exported to many foreign countries. At present around 6 lakh tonnes of fishes are produced each year. The Kerala government is very much involved in overseeing the fisheries sector and has helped in promoting the activities in the state. The aims and visions of the government in this sector can be fulfilled with the help of the Department of Fisheries. They have taken measures for the development and management of fisheries in the region. Together with that they also have to take steps for the welfare and upliftment of the fishermen. For that a number of programs and projects have been undertaken by this department. In Kerala, we obtain fish not only from the sea but also from the immense fresh water. In this state 44 rivers, 53 reservoirs, 53 backwaters and the remaining water bodies have fisheries. All these inland water bodies together with the sea have helped in the growth of fishing industry in Kerala. At present, yearly about 75036 tonnes of inland fish is produced. Fish and fishery products are in great demand always and it is increasing day by day. They are in demand both in the domestic and foreign markets. 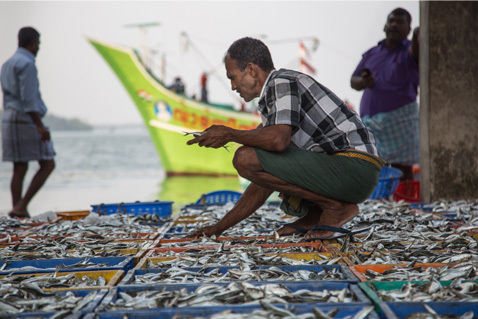 According to the 2007 reports, an estimated share of 5.34 million tonnes is expected from inland fishing and 3.10 million tonnes from marine fisheries. The fishermen population in Kerala is about 11.114 lakh, out of which 8.558 lakh is in the marine sector and 2.556 lakh is in the inland sector. There are a large number of people whose main source of income is through fishing. There are fishing villages in the marine as well as in the inland sector. The population of fishermen is highest in Alappuzha with a population of 1.86 lakh followed by Thiruvananthapuram (1.83 lakh). The economic zone in Kerala is the sea which is spread upto 200 meters and is adjacent to the coastline. According to the Kerala Marine Fisheries Regulation Act, the sea shore area within the range of 50 meters is demarcated for fishing by the traditional fishermen. Whereas the area beyond the limit in the economic zones can be used by motorized boats and large vessels. But people do not usually follow this rule. Hence, to prevent this, monsoon trawling began to be banned from 1980 onwards. We obtain around 300 different species of fishes from the Kerala coast. Out of which only around 40 are of commercial use. There are certain high value fishes such as Seer fish, pomfret and prawn but their catch is considerably less. And so the share of such high value fishes in the total marine fish catch remains stagnant. Annually the prawn catch is estimated to be 64482 tonnes. The catch of oil sardine which is consumed mainly by the poor sections in the state have increased in the recent years.